Download Miracle Box 2.58 Latest With Loader, Here you can download the latest Miracle Box 2.58 With Loader and the good news is you can use this tool without Miracle Box, and this is the latest Miracle Box 2.58 with the loader that supports almost all china android and Samsung, LG devices, Here below we also provide the Miracle USB Driver also to detect your device very easily in this Miracle Thunder tool. Miracle Box 2.58 Latest With Loader tool helps you to read your device firmware, flash file to helps you to write firmware and do anything about your devices. if your device goes wrong or if dead your device then the read firmware will back your device again with working condition. This tool helps you to write the firmware to your MTK, Qualcomm, MTK, SPD, Coolsand, and Mstar devices very easily. -After the hard reset, if you forget the previously synced Gmail Account, then you need to bypass the Gmail ID to use your device again and the Miracle Box 2.58 Loader tool helps you to bypass FRP Google Account to access your devices again, Miracle Box 2.58 Loader Reset FRP on MTK, SPD, Qualcomm, Coolsand devices very easily. -Miracle Box 2.58 Loader tool helps you to read various Codes like network unlocks codes, Passcodes and many more codes this tool will read very easily from your MTK, Qualcomm, SPD, Coolsand, and RDA and MStar supported devices easily, using only ADB Mode. -Its helps you to Read the Pattern locks from your various Android devices which support MTK, Qualcomm, SPD, Coolsand, RDA and MStar chipsets. -Its helps you to remove the virus without Flashing from your MTK, SPD, Qualcomm based Android devices very easily. -Its helps you to remove Mi-Account from your Xiaomi Redmi and MI devices very easily, This tool helps you to Remove the MI-Account With EDL, ADB, and Fastboot Mode from your Xiaomi Redmi, MI devices. 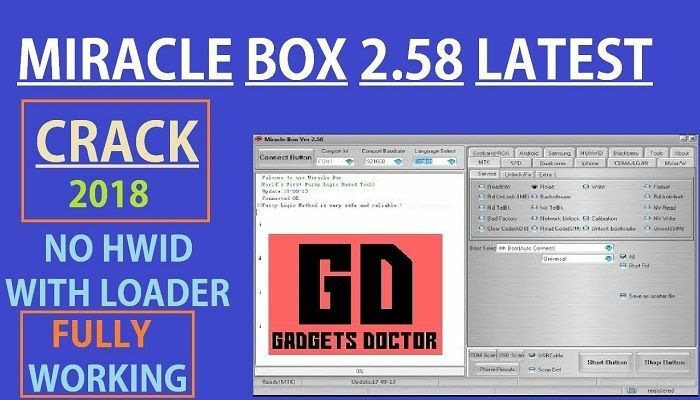 And Many more features you can do with Miracle Box 2.58 with loader version, and you can feel the power of Miracle Box 2.58 Latest With Loader. -Download first, “Miracle Box 2.58 Withloader.zip” from below. -Once extracting finished, open the extracted file folder. “Miracle Box 2.58”. -After that, Run the “Miracle 2.58_setup.exe”. -Then an installer will open. there “Accept the Terms & Condition” then click next -> next -> next -> “untick the Open Miracle thunder and Readme.txt” -> then click finish. -Now go to the “Desktop”. -There you will see the “Miracle 2.58” shortcut will be added. -Just select the “miracle shortcut” then right click on the shortcut. -Now a new window will open. -Then go to the “First Extracted Miracle Thunder” folder. -Now copy the “Miracle Box 2.58 Loader.exe” from there. -Then paste the “Miracle Box 2.58 Loader loader.exe” into the “Miracle 2.58” installation directory folder. -Then Run as Administrator “Miracle Box 2.58 Loader.exe”. -Wait some time to Open the “Miracle 2.58.exe”. -Once open, you can use the Miracle 2.58 Latest tool without box. Thanks for visiting us, Comment below if you face any problem With Download Miracle 2.58 Latest With Loader, we will try to solve your problem as soon as possible. you can check other some tutorial here to help you.